A great AR-15 target and plinking ammo that is accurate enough to produce great results across the board, considering it is often relegated to a low-cost alternative placement in most shooter’s minds. The Brown Bear .223 Remington load is a continuation of their already proven steel cased cartridge portfolio that has a reputation that is significantly better than many competitors that cost twice as much. Brown Bear is brown and gets its name from the brown coating on the steel casing. 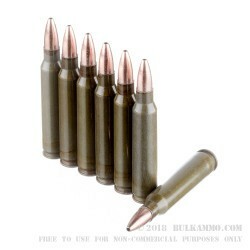 In the case of this .223 Remington ammunition, this is reminiscent of the 7.62’s that came over in the 1970’s and 1980’s to America. This comparison is an apt one, as the rounds offered here in a .223 Remington loadout, is every bit as reliable, and performance oriented as those early SKS/AK loads, and it still offers the legendary Brown Bear value for dollars spent. 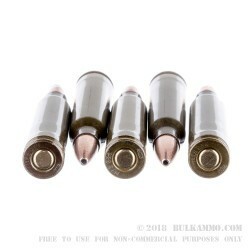 This is a 55 grain hollow point load that can legitimately function on the range, in the field against medium and intermediate sized game including deer (where you can hunt with a .223 non copper projectile) or as a home defensive/tactical load. The grain weight isn’t massive, but it is versatile. Combining this versatility with the ignition consistency afforded by the Berdan primer and the great track record for extraction and loading, and suddenly, this round makes a lot of sense, even to shooter who would never have considered a steel cartridge before.